Site work progresses on January 5, 2017. Children gather in front of a row of construction machines on December 25, 2016. This temple is a gift for our children and generations to follow. A beautiful celebration was held at the site of our new upcoming ISKCON Parsippany Temple. The new 3.25 acre plot sits at the heart of Parsippany NJ (rated by Forbes this year as one of the top 5 best places to live in the US) and will be the new home of Lord Krishna. Dozens of enthusiastic devotees participated with great zeal and energetic kirtan. The weather was amazing for this time of year and we feel very confident that this grand project will proceed nicely. This was followed by a beautiful Nrsimhadeva yajna held at the Towaco temple. We celebrated the start of the temple construction and are grateful that we can offer this commencement as a gift to Srila Prabhupāda on this fiftieth anniversary of ISKCON. Please watch this space for future announcements and updates. Hare Krishna. Hare Krishna! We are overjoyed to report that the very first contract for the magnificent new ISKCON Parsippany Temple was signed this week in the auspicious presence of Lord Krishna. The site work is slated to begin within the next few days and it is a truly incredible milestone on this long journey. We are very happy that this has taken place on this 50th year of the founding of ISKCON in 1966. It serves as a heartfelt offering to His Divine Grace Srila Prabhupada (ISKCON's Founder-Acharya) to whom we are forever indebted. The devotees at ISKCON of New Jersey have been working tirelessly over the past eight years to acquire the land, the permission and the startup funds to get to this incredible turning point. These efforts have culminated in the signing of this contract and the entire New Jersey ISKCON community is thrilled to see the project take shape. Please join us in celebrating this achievement by participating in the upcoming programs at ISKCON of New Jersey. 2:30 pm: Gaura Nitai deities will visit the construction site (176 Troy Road) with a rousing Kirtan to bless the commencement of construction work. 4:00 pm: Following the event at the construction site, there will be a special Yajna perfomed at the Towaco temple. Please join us in this historical event. The grounds at the site of the upcoming new ISKCON temple in Parsippany, New Jersey were abuzz with a flurry of activity at the crack of dawn on Saturday September 26, 2015. Dozens of ecstatic, bright-faced devotees were quickly making preparations for the grand Bhumi Puja festivities that were about to start. The team of world-class brahmana purohitas, led by Amara Dasa from Berlin our very own Brahma-Muhurta Dasa and North American deity minister Jayananda Dasa was intensely focused on putting the final touches onto the colorful array of mandalas and paraphernalia within the yajna shala. The sacrificial arena itself, beautifully constructed by the congregational volunteers under the leadership of Narottama Dasa, was a sight to behold. A set of brightly colored wooden, concentric fences framed the magnificent fire kunda that had been built with over 700 bricks. A vast tent equipped with a stage, chairs and an exhibition area showcasing a scale model of the proposed temple building was almost ready to go as the sound engineers made their final calibrations. It was 8:00 am and everyone quickly stopped what they were doing. Sri Sri Gaura Nitai had just arrived to preside over the event and they were welcomed by an enthusiastic kirtan. Their welcome procession was led through a stunningly decorated reception area and visual exhibits. The procession continued around the yajna shala and to their altar within the tent. The worship was started off with a sankalpa vidhi in the tent followed after which all the yajamanas and guests moved to yajna shala. It was amazing to see nearly a hundred devotees all dressed in harinama chadars and traditional pujari outfits neatly seated in rows ready and excited about the once-in-a-lifetime chance to offer oblations to the sacred fire. With a ring of the bell, the yajna began. Guests looked on with amazement as the Western purohitas performed complicated mudras with effortless grace and enunciated Vedic mantras in perfect tone and meter. The yajna concluded with a loud "svaha" and a beautiful purnahuti or final oblation to mark the completion of the rituals. The attendees then filed into the large tent and His Grace Radha Jivan Dasa led us in an appreciation of the vital importance of building this grand temple for the Lord. His potent words inspired a flood of donors who eagerly came forward one after another with pledges ranging from $500 to $50,000. Within an hour nearly half a million dollars were pledged by the enthusiastic crowd of supporters, some of whom had come to an ISKCON event for the first time. This overwhelmingly awe-inspiring fundraiser was followed by a beautiful ceremony to install the Deity of Ananta Sesa within the ground exactly under the spot where the temple altar will be built. Lord Ananta holds up the weight of the entire creation on His hood and whenever Lord Hari descends upon this Earth, Lord Ananta is there to serve as Vishnu's transcendental seat. So as per tradition the purohitas accompanied by temple devotees took The gorgeous silver Deity of Sesa Naga and installed Him with mantras and auspicious articles. The happy crowd cheered with loud chants of "Haribol!" and the atmosphere reverberated with transcendental sound vibrations. Prominent community leaders such as Commissioner and Assemblyman Upendra Chivukula, Mayor James Barberio, Councilwoman Loretta Gragnani and Councilman Michael dePierro graced the event. These honorable speakers enthused the audience with their words of encouragement and they were presented with gifts of shawls, a traditional way of showing appreciation to respected guests. A lavish prasadam feast was served out lovingly to all the attendees by dozens of smiling devotees. Each dish was exquisite in taste and everyone enjoyed it with great relish. Everything about the event was replete with auspicious signs. Getting the permission to build the temple was a long struggle that took five years of legal battling, but finally Lord Krishna's temple was victorious. This event marked the culmination of that struggle and the start of an exciting new phase to see the manifestation of the structure. The weather during the Bhumi Puja was magnificent - clear skies and gentle breezes. The turnout was large and encouraging. All the dozens of devotee volunteers poured their hearts and souls into the remarkable effort to bring this event together. Devotees and guests pledged their financial support in droves. We even saw a majestic eagle gracefully fly over and circle the yajna during the fire sacrifice. Amara Dasa remarked that this was a very auspicious sign and that the eagle indicates the presence and approval of Vishnu since the eagle is the symbol of Garuda. It was clear that Mother Bhumi Devi was pleased with this sacrifice and all signs point to a successful project. May all those devotees who served in this event be blessed with transcendental bliss and bhakti. Wednesdays are considered very auspicious beginnings for important undertakings. Today, Wednesday, July 22, 2015 seems like just another Wednesday, but for the devotees of Lord Krishna here in Northern New Jersey it is a day of monumental importance. Several large vehicles and construction machines descended upon the parcel of land at 180 Troy Road to start the clearing of brush, dead trees and extra vegetation to prepare the grounds for the future home of the new Hare Krishna Temple - ISKCON of Parsippany. The weather was perfect and Mother Earth seemed joyous. She is, after all, considered the consort of Lord Vishnu and nothing is more pleasing to her than to see her land being used in His direct glorification. The workers moved deftly and within just a few hours managed to clear a good portion of the 3.2 acre wooded parcel. This project is certainly an ambitious one. A multi-million dollar budget can be daunting, but the devotees of the Lord have kept faith that, as promised in the Gita, Sri Krishna will carry what is lacking. Finally more than six years after having acquired the land, tangible work has started on the project and has already begun to remove doubts from the minds of the reality of this project. It is indeed happening–right before our eyes. By the generous contributions of our congregational devotees we have raised nearly 1.5 million dollars in pledges over just a few weeks and the momentum continues to grow daily as the fortunate people of New Jersey see the vision unfolding before them. If you are in the area, please go and visit the site at the corner of Troy and Baldwin Roads in Parsippany, New Jersey. Also visit our current temple at 100 Jacksonville Road, Towaco, New Jersey. Open daily and especially for our weekly Free Sunday Love Feast at 5:30pm every Sunday. Click on the image below to see other images from the site. Things are starting to “get real”, as they say. On a bright day last week, members of a surveying crew descended upon 170 Troy Road in Parsippany, the site of the future home of Their Lordships Sri Sri Gaura Nitai. 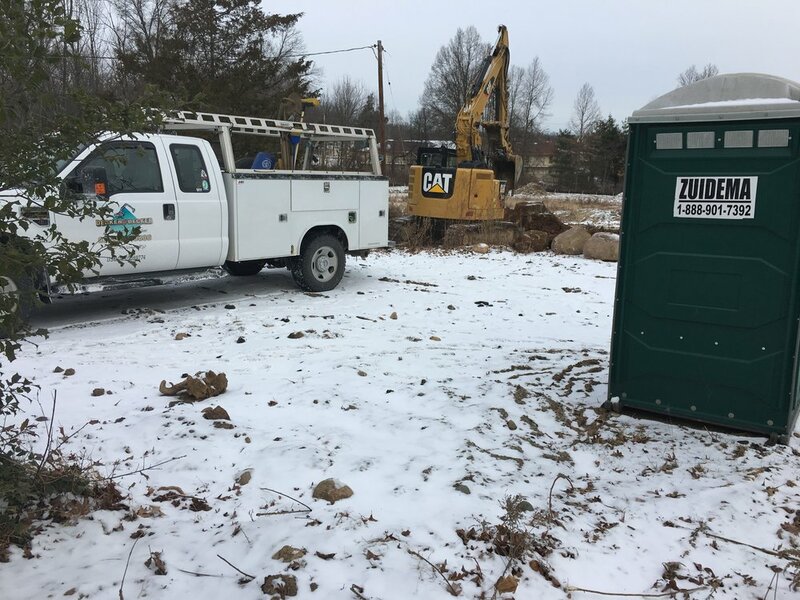 They have started the preliminary work of surveying the grounds for the first phase of the grand project of the new ISKCON of Parsippany Temple. Although it was relatively quite at the site while the surveyors worked, this day marks the culmination of many years of hard work on the part of the devotees who have struggled to raise funds, design the plans, and apply for zoning permissions. Like the legendary ksatriya Arjuna, the devotees have had the Supreme Lord on their side and by the mercy of Srila Prabhupada and Sri Sri Gaura Nitai we received the permission to build this new temple in November 2013. It was not easy, but it was a sweet victory. There is still a long road ahead and there will be struggles, without a doubt, but things are moving along. Please join us in this monumental initiative to build this temple. It is YOUR temple where all members of your family can reap the immense spiritual benefits of service to the Supreme Lord. On Sunday June 7th 2015 our presiding deities of Sri Sri Gaura Nitai made their first pilgrimage to our new temple property in Parsippany, New Jersey. Sri Sri Gaura Nitai were given the opportunity to properly survey and bless the land, and afterwards HH Bhakti Rasamrita Swami spoke some words of encouragement as we launch this endeavor to build Sri Sri Gaura Nitai a grand new home. HG Radha Jivan Prabhu scheduled a return trip to New Jersey on Friday June 12, 2015, making a special excursion to our humble temple while he was visiting New York with the TOVP team for the grand Ratha Yatra celebrations. As he had promised before, he was able to assist us in collecting $1.2 million in pledges over the next 5 years from some of the local devotees who were able to attend the presentation that evening. This evening alone has singlehandedly shifted the momentum of our project and we are now in the stages of planning a grand groundbreaking celebration this fall to be followed by construction. This past April Lord Nityananda’s paduka and Lord Nrsimhadev’s Sitari from Sri Mayapur Dham visited our ISKCON center in Towaco New Jersey while on tour to create awareness of Srila Prabhupada’s TOVP project. We were fortunate to have their association for almost a week preceding the presentation they were to make a visit to our new temple project in nearby Parsippany NJ. Lord Nityananda toured the entire property and gave his mercy to our community. That evening the TOVP team was able to raise $350,000 in pledges for the project in Sridham Mayapur to assist making Lord Nityananda’s vision a reality in the near future. HG Radha Jivan Prabhu told us that if the TOVP was able to raise 350K, for our project we will be able to receive far more, and he personally pledged to assist us in doing this.